The gate piers to North Lawn are an early feature at Norton Conyers. The 18th century orangery is in the centre of the walled garden. 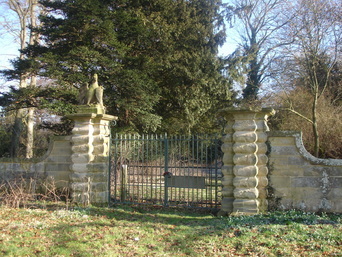 The mid 18th century entrance to Norton Conyers at Wath Lodge has two pedimented pedestrian gateways either side of wrought-iron gates. The triangular pediments have a coat of arms and the motto, 'Reason contents me'. There is a Chinoiserie element to the wooden pedestrian gates.